Overall experience was very relaxing. Was disappointed that pool and hot tub wasn't working. We loved it. Very spacious and beautiful view. Cathy's Cove is an amazing location!!! Felt like we had our own little retreat away from the world! The home was clean and cozy, especially with the fireplace since we had a snowstorm happening outside(! ), the key lock-box was super convenient, and the pottery cups/bowls are so beautiful to use. We'll definitely return - what a treasure!! I can say nothing other than it was a wonderful home for our family. We loved that it had a family feeling to it. We felt like we were in our own home and not away from home. It had everything that one could ask for; view, privacy, very comfortable. Kitchen was grand. There was nothing that we felt it needed. Beautiful home on a magnificent setting! The lake was breathtaking off the deck. Excellent overall experience! The cabin was awesome, while nothing fancy from the outside it is spacious and beautifully lit with so many windows overlooking the lake. The lake is breath-taking and it was warm enough in March to sit lake-side and 'take in' the sunset and sounds. The cabin is nestled in a secluded location which was a delightful surprise to us never having made a drive back on Caribou Trail. The cabin had all the necessities and we were very comfortable and sad to leave. We would definitely stay again. Everything was perfect. The location of the unit with the view in all directions was amazing. Love the easy arrival with the door code rather than having to stop for keys at the office. Appreciate the little things like the Keurig with choices other than just plain coffee. Also, LOVE all the little notes/instructions. Never had a question about which switch was for what. would not change a thing.. the rent two nights get a third free promo made this the perfect choice. 26 was lovely.. loved the art and decor. I appreciated having our well behaved dog in a location that was not old and run-down looking. The home was wonderful. 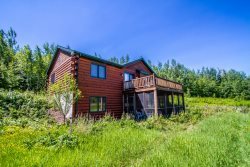 Such a perfect location and so close to Lake Superior, the views from every room were beautiful! The heated tile floors in the lower level area was fantastic especially during winter stays! Beautiful, comfortable home, well stocked with games, movies & books. Gorgeous place to stay & enjoy our family! Thank you! I thought the condo was great! It was renovated and decorated very nicely. The view was amazing! We typically will stay up on the mountain for ski in/ski out availability and were a little nervous that we weren't staying right there. After staying here, our fears were unfounded. The house was plenty big for all of us, we didn't feel we were on top of each other and getting to and from the hill was easy. We wish there had been a hot tub - that would have given you the last 1/2 star. Or, at the very least, work it out with Eagle Ridge to allow us to use the pool/hot tub there. The house was nicely furnished. Plenty of plates and glasses for us and 'extra' items such as the crock pot and other utensils were nice too. I would recommend this to friends and will consider it next year for our yearly trip. The home was very nice with a great view of the lake. It provided me with everything I needed and was a short drive to the ski hill. The place was amazing! We enjoyed the secluded location while still being close to the mountain. The email we received ahead of our stay was very informative and helped us prepare for our visit. We wish there had been a cutting board and basic salt and pepper. Thanks! Location is excellent. Home is very comfortable. High quality mattresses and linens. Would suggest new couch and living room chairs - in pretty tough shape. Sleeper couch would have been nice for teenage son. View is spectacular. This was our second stay here. Toaster didn't work. No LP gas for grill. keep pool and hot tub open longer, work with snowmobile club for better access to trails. Beautiful view, day and night!